If you’re anything like what seems like most of the North American population these days, chances are you have trouble falling asleep. We are very busy beings and sometimes when it’s time to end the day and crawl into bed to rest, our brains turn up the hyperdrive and do everything except relax. If this sounds like you, maybe you’d like to try a little yoga before bedtime. It may help you to relax and fall asleep sooner which means you’ll get a much needed longer and better quality sleep. Follow through the following sequence and see what you think. These poses were chosen because most can be done in bed so you can just curl right up when you’re done. 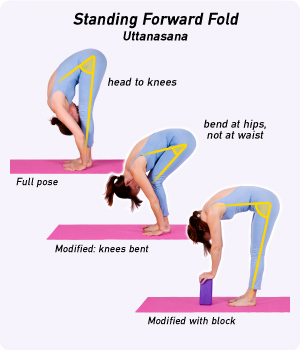 Yoga has a strong foundation in breathing, or pranayama. Studies have also shown that taking deep, drawn out breaths helps to calm the mind and relax the body, both of which are essential pieces to getting a good night’s sleep. Start this sequence by concentrating your breathing. Take big, long, heavy drawn out breaths and try to concentrate your mind on your breathing rather than all of the other things that may come to cloud your mind at night time. For a more in depth section on breathing and for a few different breathing techniques, go here. Still focusing on your breathing, stand up tall and lift your arms high up above you. Bend at the hip and slowly lower your head down to the ground while keep your back straight. Reach towards the ground with your hands and the crown of your head. You may or may not bend your knees. It’s really up to you and what feels comfortable. Remember, you are trying to relax! Hold for 10 nice long breaths. Seated now, bring one foot into the centre of your body with knee bent and bring one foot out to the side and straightened. You may also know this as the runner’s stretch. Bending again at the hip, slowly lean forward (again, to wherever is comfortable for you!) Hold for 10 long breaths on each side. This might be one of the more common poses. It is generally a comfortable pose, especially when on your bed as the mattress will feel nice under your knees. However, if it is painful having your knees bent, please bring the hips up higher or bring the knees out wider, or opt to hold another pose for longer in it’s place. For child’s pose you will be on your knees, sitting back on your heels. Reach your arms and body forward, bending at the hip joint. Or keep your arms beside you as shown in the second photo. Hold for 10 long breaths at your point of comfort. Bring your buttocks as close to the all as possible or up against your headboard if your bed is situated in the centre of your bedroom. Bring your legs up the wall with heels facing the ceiling. You may wish to prop your hips and low back up on a pillow or two as shown, or you may be more comfortable without. Hold for the usual 10 long breaths. This may be one of my favourites. Lying on your side, bring the top leg up and over the bottom leg, bending the knee. The bottom leg will stay straight or the knee may bend slightly. It is important that your top knee is connected to either the bed, or you may want to put a pillow or two under the knee. As long as it is connected to either a pillow or to the bed itself, you’re in good shape. Use your bottom hand to rest on you top knee, and open the top arm away from your top knee, opening the chest. Hold for 10 long breaths on each side. Arguably one of the best parts of yoga class is savasana. Lay down on your back with limbs open and straight. Close your eyes. Re-focus again on your breathing. Think about your body becoming heavy and sinking in to your mattress, getting ready for bed time. If you have a tough time willing your body to just relax on its own, try contracting one muscle group at a time for 2 seconds then relaxing it. Start from your trunk and work your way out to your fingers and toes. At this point, hopefully you’re feeling a little more calm. Get cozy in bed and drift off to dreamland.